NEW YORK — Brian Dozier rounded third and yelled “Let’s go!” at his teammates, and it seemed these Twins might finally be the ones to foil the New York Yankees in the playoffs. 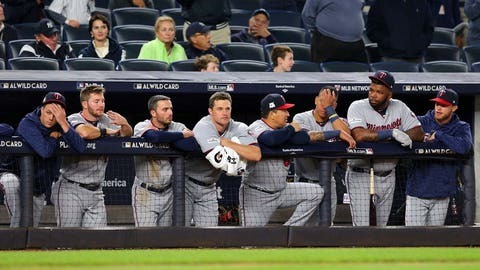 Minnesota starter Ervin Santana blew a three-run lead in a wild first inning, and the Yankees piled on from there, handing the Twins a record-tying 13th consecutive postseason defeat with an 8-4 victory in the AL wild-card game Tuesday night. Minnesota matched the Boston Red Sox from 1986-95 for the worst postseason skid ever, with 10 of those losses coming to New York. The Yankees eliminated the small-market Twins from four AL Division Series from 2003-10, crushing the World Series aspirations of Minnesota’s self-developed core. “l’ve heard Frank sing that song probably too many times and you can’t get them back,” Twins manager and Minnesota native Paul Molitor said two weeks ago. Same old song Tuesday night. With so many new faces, this time could have been different. Joe Mauer is the only holdover on Minnesota’s active roster from its previous playoff appearance seven years ago. He’s with a team that’s already wrecked some history, too — the Twins went from 103 losses in 2016 to the playoffs this year, a first in major league history. They even started strong Tuesday, chasing Yankees ace Luis Severino with one out in the first on homers by Dozier and Eddie Rosario. Still, Minnesota got to showcase how it got here — a remarkable feat for a team that picked first overall in the June amateur draft. The turnaround was fueled by a focus on fundamentals, especially in the field and on the bases. Byron Buxton exemplifies that, emerging as an AL Gold Glove contender in center field and one of the game’s premier baserunners. In the second inning Tuesday, Buxton tracked Todd Frazier’s deep fly ball and made a leaping grab, slamming back-first into the wall before tumbling to the ground — exactly the sort of play Minnesota fans are accustomed to seeing from him. This one was costly, though. Buxton was lifted in the fourth because of tightness in his back, which stiffened up when he beat out a potential double play for an RBI fielder’s choice and then stole second base in the third. It left Minnesota without Buxton and slugger Miguel Sano — he was left off the roster because of a left shin injury — and the Twins just didn’t have enough to overcome New York’s overpowering bullpen. With so many young players, Minnesota has a chance to get back to this stage. After all, if the Twins can put 103 losses behind them, what’s one more? And the club’s history of overcoming adversity runs deeper than that. The Twins even battled skepticism from their own front office — general manager Thad Levine traded away starter Jaime Garcia and All-Star closer Brandon Kintzler before the trade July 31 deadline, which Molitor acknowledged fired up some players in the clubhouse. There weren’t many chances late for Minnesota. With two on and a three-run deficit in the sixth, Mauer hit a drive to deep left field, but Brett Gardner grabbed it on the warning track in the corner. Then it was Frank’s turn — again.